In effort to support community organizations close to the heart of MAKE, we are highlighting causes with which we are passionate. This is the first in a series of spotlights on Special Olympics of Illinois, a group that is near and dear to us because of its importance to our own MAKE family, one of our clients, and the community as a whole. Please follow us as we introduce you to some special athletes and the teams that support them. When Cassie was eight years old, she decided she wanted to play sports just like her big sister (MAKE’s own Abby Wohlhart). In the last 11 years, Special Olympics of Illinois has given countless unforgettable moments for 19-year-old Cassie Wohlhart. Cassie participates in several sports but she enjoys running and snowshoeing the most. She participates in the 400 and 200 meter snow relay. Her track events are 100 meter, 400 meters, and relay racing – and she has even taken home a gold medal. Pictured below is Cassie with her sister Abby, who is a member of MAKE’s recruiting team. Thanks for introducing us to Cassie, Abby! We had so much fun meeting her, and we are excited to be part of her cheering team at Special Olympics events. The Windy City Rubber Ducky Derby is a signature annual fundraiser benefiting Special Olympics Illinois. As part of our mission to enrich the quality of life for children and families in our community, we purchased each of our Illinois consultants and the entire MAKE staff a duck for the derby. Throughout the week leading up to race day, Customer Service Representatives Diana and Jess hand-delivered the adoption papers to our consultants at their various client locations. To learn more about the Ducky Derby or the Special Olympics of Illinois, you can do so on their website at soill.org. NF Walk for The Children’s Tumor Foundation. Learn more about The Children’s Tumor Foundation here. Little Friends, Inc. We represented team “Shane’s Scrambled Legs” at the Step Up for Autism Walk. Learn more about Little Friends, Inc. here. Ronald McDonald House Charities Technology Golf Classic. MAKE sponsored hole 1E at this year’s event. Learn more about Ronald McDonald House Charities here. 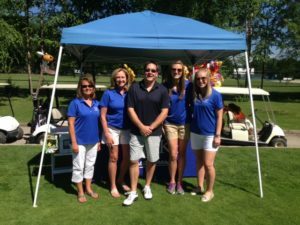 MAKE was proud to partner with Discover Financial to sponsor & participate in the Loretto Hospital Foundation’s 13th Annual Golf Outing. Learn more about Loretto Hospital Foundation here. The American Cancer Society Relay for Life of Oak Brook Corporate. Learn more about Relay for Life here.